You’ve been slaving over a story. You’re twitchy with caffeine. Your family hasn’t heard from you for hours, or even days. If you’re like most writers, you’re thrilled. You’ve just poured your heart and soul into this and you want some sweet affirmation after all your hard work. This question may seem harmless enough. But this is a dangerous question, and if you want to become a better storyteller and write stories that actually ARE good, you need to stop asking if your work is “good” and pursue a much different route to get useful writing feedback. When I teach Creative Writing, I always spend a day training them for workshop. One of the first lessons I teach is to never describe something as “good” or “bad.” That’s not helpful writing feedback. When writing stories, we tend to forget that we are creating complex narrative machines with many moving parts. When done, we hand those machines to human readers, all of whom approach stories with unique points of view. Does that mean it is publishable? Does it mean that reader would buy it for $19.99 in hardcover or $2.99 on Kindle? Does it mean the reader is a friend and doesn’t want to hurt your feelings? What is “good,” after all? The truth is, “good” is just a value judgment from a biased person. It has nothing to do with how well your story functions. It doesn’t say anything about whether or not your story will work — or be “good” — to thousands of readers. “Good” is a meaningless word that can lull you into a false sense of satisfaction. Watch out for this word. It is the enemy of the storyteller who wants to grow in his or her craft. It is wine to the artistic drunkard’s ears. Don’t ask whether your story is “good.” Instead, ask whether it works. The main problem with “good” is that this word tells us nothing useful. We can’t do anything with that writing feedback. We don’t learn if our protagonist is relateable and/or likeable. We don’t learn if each of his or her choices, and the choices of other characters, make sense to the reader. We don’t know if our setting is well-drawn and integrated into the action. We don’t know if the story flows well. And we certainly don’t know what emotional connection, or disconnection, the reader experienced throughout our story. 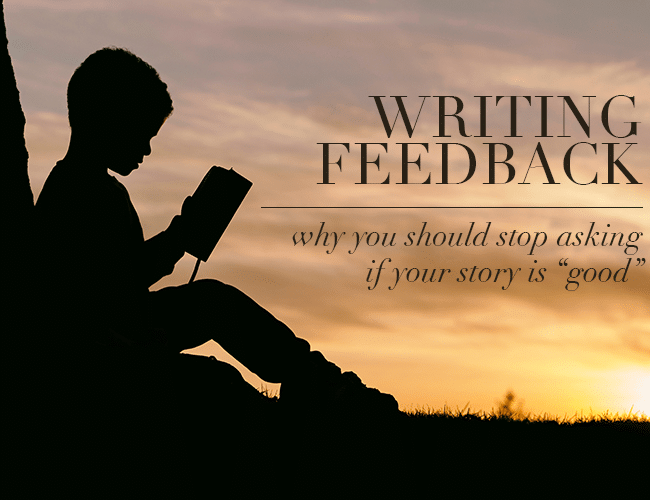 “Good” is the answer you get when you don’t ask for effective, specific writing feedback. It is usually the word non-writers use because they aren’t keen on the moving parts to the complex machine we’ve created. And we should use it in varying forms, catered to the reader’s experience with each particular element of the story. While there are tons of questions you could ask about how your story works, here are three that will help you convert any flimsy first draft into a powerful story right away. The fundamental building block of any story is the Protagonist’s goal. His/her motivation for pursuing the goal is also essential, as the reader has to be sufficiently motivated to care about what happens. These questions will point your reader directly at the core of your story: its central desire. Nothing drives the plot as much as this foundational element, and you have to get it right — so ask the right question when you seek feedback. With this question, you are asking if your plot works. Your plot is “what characters choose, followed by consequences, followed by more choices.” Trey Parker and Matt Stone employ this rule in their writing for South Park, which is one of the reasons the show has been running for more than two decades. It is here that you’ll probably encounter the most questions and therefore do the most revising. That’s because it is imperative that your reader understand why characters do what they do, and why the consequences are what they are. This guarantees that your story has strong internal logic and makes complete sense. Part of a storyteller’s job is to build a reader’s emotional investment in the characters and the characters’ lives. The way to do that is through high stakes and authentic consequences. As a two-time judge for The Write Practice’s Writing Contests, I’ve read many stories that piled on the suffering, thinking this would pave the way to a win. This may sound crass, but putting death, kittens, cancer, or Sarah MacLachlan in your story do not make it emotional (though it may be manipulative). By specifically asking our readers about their emotional journey, we can diagnose the strengths and weaknesses of our stories’ stakes. If readers aren’t responding the way you’d like, perhaps you need to up the ante and force the Protagonist to put more at risk. If a relationship isn’t inspiring compassion, make those characters pursue a common goal together, increasing the stakes if something bad should happen to both of them. And if the end of your story doesn’t seem to satisfy, add some authentic consequences: make victory (or defeat) cost a little more. Reader emotions can be deceptive, especially if you’ve set out to write an “emotional” story. Make sure you’re getting the right emotion at the right moment, and don’t make the mistake of thinking that all emotions need to be negative. So should you still ask if your story is “good?” Maybe just even once? Well, if you ask the better questions, questions that get specific and useful feedback about particular elements of your story, then you will be armed with some of the most valuable information a writer can have. And if you use that information to craft numerous drafts, each one more effective than the last, you will create a story that works, and works for thousands of readers. Because if you take this advice and do your job right, you’ll never have to. Your adoring readers will gladly do it for you — over and over again! What other questions do you ask to get great writing feedback? Let us know in the comments! Today’s practice comes to you in two parts. First, take fifteen minutes to write a story based on this prompt: “But why? That’s so gross.” Or, find a piece you’ve already written that you’d like feedback on. Then, share your writing in the comments and ask one of the three questions above. Once you’ve shared, read your fellow writers’ pieces and answer the question they’ve asked. You deserve a great book. That's why David Safford writes adventure stories that you won't be able to put down. Read his latest story at his website. David is a Language Arts teacher, novelist, blogger, hiker, Legend of Zelda fanatic, puzzle-doer, husband, and father of two awesome children.